As much as I am a fan of Sci-fi, I’ve often limited myself when it comes to an interest in science in the traditional sense. Something about the way it was taught to me never exactly resonated with me. This changed, however, when I was exposed to the concept of Afrofuturism. First off, there is nothing “traditional” about Afrofuturism—for me the concept seems to transcend the information transmitted in the classroom settings I remember—instead reaching me in a way that is almost spiritual (I know… deep stuff). I recently had an opportunity to catch up with Rasheedah Phillips, an expert on Afrofuturism and founder of The AfroFuturist Affair to gain better insight on the concept as a whole, as well as learn more about her efforts through The AfroFuturist Affair. “Afrofuturism uses a completely different construct of time and engages a different notion of time consciousness and notion of the future than does the European brand of futurism, which is based on linear constructs of time and progress, and remnants of Newtonian physics updated with some Einstein relativity” says Rasheedah Phillips, expert on the subject, and Founder of The AfroFuturist Affair. I admit after our conversation, and later reading her book Recurrence Plot (and Other Time Travel Tales, my interest in Afrofuturism and “black quantum futurism” (I’ll get back to this) was piqued exceedingly. To say the least, Rasheedah is probably one of the most unique and interesting individuals I’ve come across within the speculative fiction realm thus far. Now, in most cases, most people don’t just “fall” into Afrofuturism (at least not consciously)—one must be exposed to the concept somehow. To be honest, I hadn’t heard of the term until I was an adult, but like Rasheedah I had been exposed to it all along. 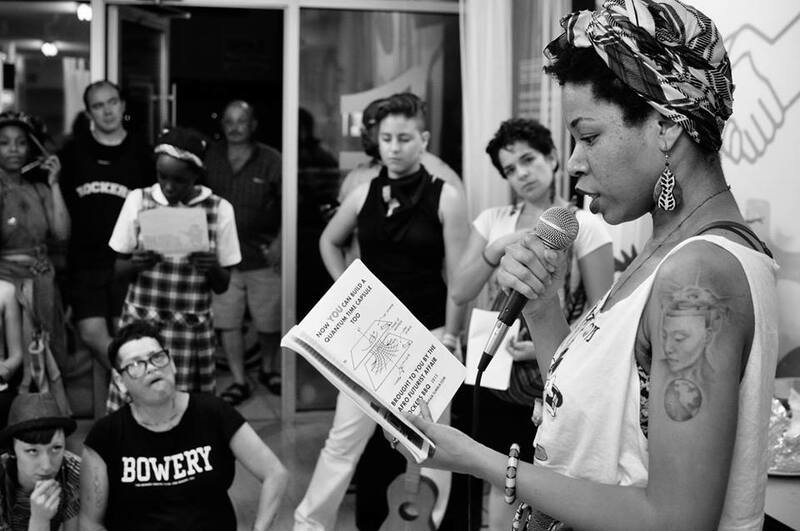 Rasheedah Phillips: I became interested in afrofuturism long before I had a name for it. I started reading and writing science fiction and horror at around age five, and grew up addicted to shows like The X-Files and The Twilight Zones, and movies like Butterfly Effect and The Matrix. Later, my experiences in college helped to develop my sense of cultural identity, and my sense of agency. My classes in Sociology and African-American studies pried my mind open to the complexity of Blackness and its multifaceted existence across racial, cultural, gender, social, and institutional lines. These courses reshaped my perspective on the world, forcing me to take a more critical approach to how I viewed the experiences of people of color as portrayed in mainstream culture and society. For several years, I rejected the traditional sci-fi culture that I loved since childhood because it did not reflect my social identity as a Black woman or the culture of people with whom I shared a history and identity. Like Rasheedah, I’m sure many women of color can relate to the feeling of disappointment at the reality that we are rarely, if ever reflected within speculative fiction via mainstream sources. I’m sure many of us can also relate to that magical feeling of an “initiation” of sorts when we were first introduced to “black folk” within Science Fiction—a feeling of discovery that we are not alone. RP: In law school, a friend gave me a copy of Kindred by Octavia Butler, who, after reading some of my writings, thought I would be interested in the story. Hooked from the first sentence, reading this novel renewed my love and enthusiasm for sci-fi. After reading all of the Butler novels, I went on to read Tananarive Due, then followed the trail to other works of Black sci-fi through anthologies like Dark Matter by Sheree R. Thomas and websites like Black Science Fiction Society. Coming across other Black speculative writers and whole communities dedicated to Black Science Fiction and Afrofuturism inspired me to begin writing my own sci-fi stories again, and ultimately, to create The AfroFuturist Affair. Many fail to realize how important representation is within media, especially for individuals within marginalized communities. For black women especially, Octavia Butler’s legacy has proven to ignite a flame among black women creators of sci-fi and fans alike—renewing the interest of those who gave up hope in seeing their selves reflected within the pages of sci-fi books and inspiring some to create characters of their own. Representation of people of color—specifically women of color in stories like “Kindred”, was no doubt a factor in the development of The AfroFuturist Affair. RP: The AfroFuturist Affair started out as a singular event, which was the first AfroFuturist Affair Charity & Costume Ball on October 28, 2011. I started it because I wanted a safe space for me to read my sci-fi work and celebrate sci-fi culture with others who create within the theme. 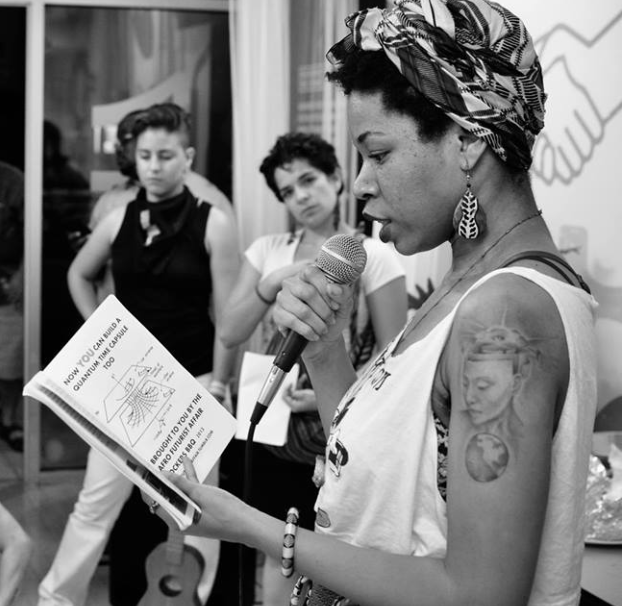 The ultimate purpose of the event is to engage and provide a platform for artists, authors, performers, and other creatives who are creating Afrofuturism-themed work and who are interested in using their creative work to serve communities who have been disenfranchised, undervalued, and underserved, and whose histories and images have been distorted in the reigning social narrative. 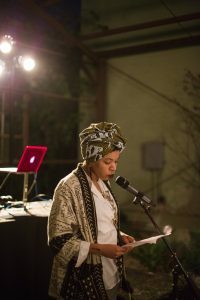 In the sense that Afrofuturism and speculative fiction is a medium for social commentary and a lens through which communities can evaluate or shape their futures, the event provides the space for further dialogue around these ideas, as well as actual, practical implementation of these ideas as they serve social progress. The charity component was to keep the event affordable and accessible to all people. I also felt that the charity component of giving back to one’s community was indispensable to the mission of the event. It is evident that in an era that is socially driven by digital media, platforms such as The AfroFuturist Affair are essential in sharing the essence of Afrofuturism with people of color, and in Rasheedah’s case, has been influential in the creation and implementation of unique concepts such as “black quantum futurism”. RP: Black Quantum Futurism – a term I put together inspired by concepts of African space-time consciousness, quantum physics, and Afrofuturism – has become valuable to me as a descriptor of the type of concepts and lens that I apply to my experiences and creative output. A lot of my writing explores the everyday ways in which we “time travel,” simply by touching and interacting with everyday objects. Objects are artifacts of memory and meaning, storing up energy, — energy which is neither created nor destroyed in the larger universe. These artifacts of memory tell events as they actually happen—as they have been experienced—while the history that we read about in books are only subjective representations of what historians believe is crucial to remember. Oftentimes, when it comes to people of color, our understanding of our history is warped—reflected in generations of people who have been fed lies about who they truly were and are—continuing to be a defining factor in who people of color see their selves as today. Without an understanding of our roots as a people, it is impossible to imagine our futures. 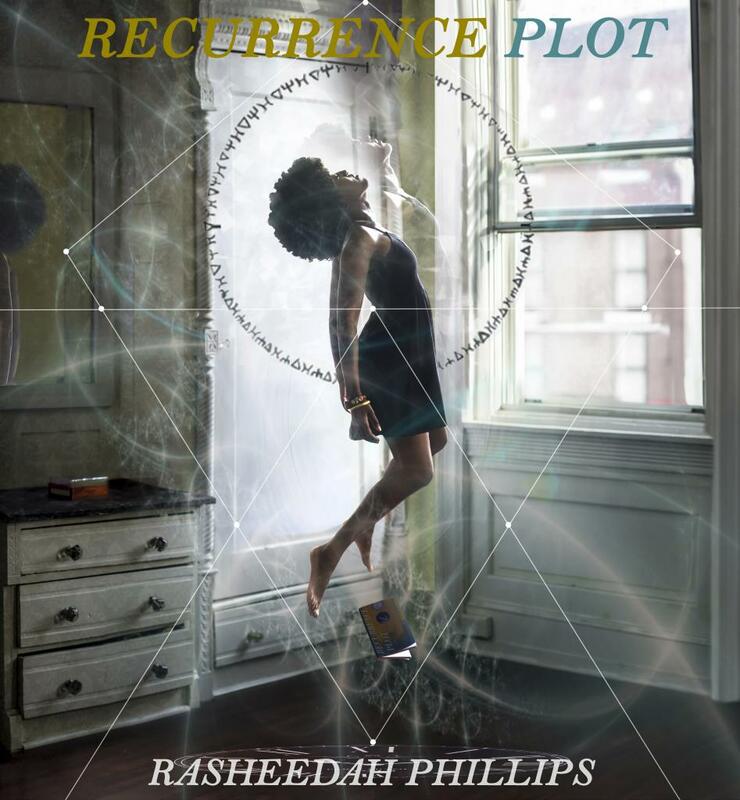 Black quantum futurism, as applied in Rasheedah’s books Recurrence Plot (and Other Time Travel Tales) and Black Quantum Futurism: Theory & Practice (Volume 1) are efforts at bridging that gap. RP: I am also really inspired by writers like Ted Chiang, Ursula K. LeGuinn, and Tananarive Due, who have the ability to tie science and speculative concepts to very mundane, everyday characters who are in settings that are very “real world” like. This style of storytelling also appeals to me for the reasons of exploring that fine line between the speculative and reality. I am deeply interested in quantum physics and time travel, so I took those concepts and weaved them into everyday situations. I am not so much interested in the idea of time travel or technology that is not accessible to the average person, or technology that is divorced from the very real questions of how it impacts poor and marginalized communities. Rasheedah is very passionate about her community and makes a point of creating stories that resonate within her community—as well as providing a platform for creators like herself. She understands and acknowledges the obstacles in place for people of color when it comes to speculative fiction. RP: Speculative fiction is only a reflection of the larger reality it is situated in. Despite the fact that creators of speculative fiction have been able to successfully conceive of novel technologies, map out the future of humanity, and envision new worlds in science fictional narratives, traditional sci-fi has, on the whole, failed to transcend the social hierarchy, supremacy, and privilege that plague our present-day realities. In a traditional speculative world, these narratives replay over and over, where Black women and other marginalized peoples are virtually non-existent or play exceptionally minor roles, seemingly due to inferior genetics and an inability to adapt to changing social and environmental conditions. Many would agree the aforementioned hindrances play a major role in how people of color are portrayed within speculative fiction. It is only through platforms such as The AfroFuturist Affair that creators of color can gain momentum within a culture that they are very much a part of—even if mainstream media fails to consistently include them. This holds true especially when it comes to envisioning the future of Afrofuturism. It is my pleasure to salute Rasheedah Phillips, a woman who is making excellent strides in support of people of color now and for the future. You can learn more about The Afro Futurist Affair by visiting www.AfroFuturistaffair.com.